How to create a listening and literacy promoting environment. Find a quiet space…. Pull up a cushion or bean bag… settle in. Let’s begin. The following resources are some ideas about how to create an environment designed to foster the love of reading and literature. The iPad is a versatile tool. We can use it to consume books and create books. 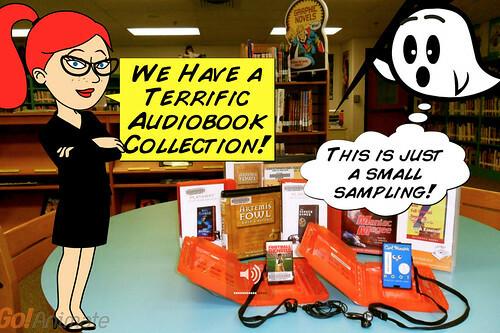 See my DIIGO weblinks to Audio Books resources (not all of these are for children). Access audio books through online subscriptions (and some with free access). Pinterest – 100 stories ebooks and appsAdd bookmarks or shortcuts to your device for easy access. Locate the AUDIO BOOK Collection (labelled as ‘Audio Book’). When you visit the library you will find the AUDIO BOOK Collection with CD’s for you to listen to and if you wish to borrow. Select your book on CD and enjoy. Additionally, last year we purchased the GUIDED CD’s resource. These are also available for teachers to use with classes. You can also buy splitters for headphone to connect to the iPads. This entry was posted in ICT, iDevices, Library, Literacy, Reader Feature, Reading and tagged audio books, ebooks, Feature Writer, Literacy 2015. Bookmark the permalink.